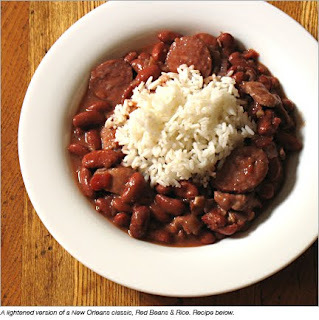 Little Mrs. Married: Red Beans & Rice! Tonight i made Red Beans & Rice and Cornbread for dinner! I am so proud of myself! I have never made it before, and even though it's a popular Louisiana dish, my mom didn't make it growing up. But i really wanted to try it! The recipe came from my Super Suppers cookbook. I told Brad i must be silly to use a recipe for a cajun dish from a cookbook written by people who are not from down south! Heehee. I tried it anyway & it was delicious! Fantastic! Hubby loved it, too! But here is the recipe for Red Beans & Rice! Hope you like it! (aka TONY'S! if you do not have TONY'S, i am so sorry! I wish i could send you some! 1) In a saucepan combine water, rice & salt. Bring to boiling over medium-high heat. Turn heat to low. Cook & simmer 20 minutes. 2) Meanwhile, preheat oil in a large skillet. Saute onion, celery, bell pepper, and garlic in hot oil until tender. 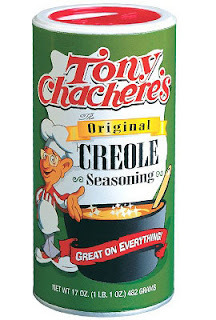 Stir in undrained beans, undrained tomatoes, & creole seasoning (aka TONY'S!!). Simmer, uncovered, for 15 minutes. 3) Serve bean mixture over rice. Yum! Now I want this! Me and my husband LOVE red beans and rice!!! I Have a great recipe you HAVE to try, it's delicious! !